Explore The Mile High City using B-cycle, Denver’s pioneering bike share program. Find out how to set up an account at DenverBcycle.com. You can also download B-cycle’s iPhone app for station locations and bike availability. WHERE TO GO: After shopping at the upscale Cherry Creek Shopping District, roll onto the Cherry Creek Trail for an off-road ride. Bikers can follow the (mostly downhill) trail six miles all the way to the Riverfront neighborhood, home to such attractions as the Downtown Aquarium, the Children&apos;s Museum of Denver at Marsico Campus and Elitch Gardens Theme & Water Park. DROP OFF YOUR BIKE AT: 1416 Platte St. PICK UP A BIKE AT: 2045 Franklin St.
WHERE TO GO: Cycle east on E. 21st Ave. towards the enormous City Park, a perfect place for a two-wheel adventure. Ride around Ferril Lake and be treated to sweeping views of the Denver skyline. During summer nights, the Prismatic Electric Fountain in Ferril Lake wows with columns of water colored red, white and blue. Visit the Denver Zoo or the Denver Museum of Nature & Science. WHERE TO GO:Head west on High St. towards Cheesman Park, a green space favored by locals. There, cruise around the route that circles the park for a ride with views of the Rocky Mountain Front Range. Then head back to Denver Botanic Gardens to enjoy 23 beautifully landscaped acres. WHERE TO GO: Ride east on E. Louisiana Ave. to Washington Park ("Wash Park" to locals), where you can coast around two lakes and kick back amidst flower gardens, big green lawns and fellow outdoor enthusiasts. Take Exposition Ave. east out of the park to Old South Gaylord St., a small but vibrant neighborhood with shops, art galleries, cafés, restaurants and taverns. WHERE TO GO: View the architecturally stunning Denver Art Museum from every possible angle. Take a spin around Civic Center Park, with the gold-domed Colorado State Capitol Building on one side and Denver City & County Building on the other. Head east on 13th Ave. to the Kirkland Museum or the Molly Brown House Museum to explore two of the city&apos;s most interesting hidden gem museums. DROP OFF YOUR BIKE AT: 1291 Pearl St.
WHERE TO GO: Pedal north on the Platte River Trail and cross over the river to the Denver Skatepark, the largest free skate park in the nation. Then loop back south along the river. In two miles, you&apos;ll pass the Downtown Aquarium, the Children&apos;s Museum of Denver at Marsico Campus, Elitch Gardens Theme & Water Park and Sports Authority Field at Mile High. Don&apos;t miss the kayakers running the manmade chutes at Confluence Park. WHERE TO GO: (Note: Bikes are only allowed on the 16th St. Mall on Sundays) Head northwest on the mile-long 16th St. Pedestrian Mall, passing the iconic Daniels & Fisher Tower and Skyline Park. 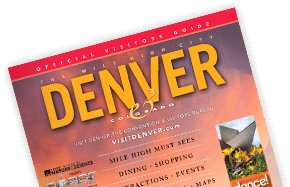 Explore LoDo (Lower Downtown), home to the Tattered Cover Book Store, Coors Field and the Museum of Contemporary Art Denver (MCA), not to mention dozens of cafes, restaurants and bars. Denver B-cycle charges a membership fee for unlimited access to the system for the duration of your chosen membership period, as well as a time-based usage fee that varies according to how long you keep the bike on each ride. You can buy a membership for 24 hours ($9), 30 days ($15) or one year ($90). All memberships can be purchased at DenverBcycle.com, and 24-hour memberships can also be purchased at the kiosk that is part of all 84 Denver B-stations. With your membership, the first 30 minutes of every B-cycle check out is no charge! After 30 minutes, there is a small usage charge for each additional 30 minutes you have the B-cycle checked out. As a member, you can check out a B-cycle multiple times within you membership period. Wear a helmet and light, bright, and reflective clothing. Ride single file when you ride with other bicycle riders. Ride on the correct side of the road. Do not ride in the opposite direction of traffic. Ride in areas with less congestion. Seek out designated bike paths and routes. Denver Story Trek and B-cycle make a great pair. The program lets visitors explore the stories behind Denver&apos;s historic landscapes and landmarks on an interactive, self-guided and bike-friendly tour of the city. It&apos;s simple to use and free! Get more info.